Your wedding gown will be carefully inspected and an individualized treatment plan will be determined based on your wedding gown fabric, trims and style. Our goal is to return your gown to perfect condition. Our wedding gown care experts will determine the best method of cleaning for your gown to protect it from damage while still getting the stains out. We give your wedding dress TLC (tender loving care.) Unlike wholesale dry-cleaners and many national companies who clean wedding gowns in large quantity (as many as 30 gowns at a time), each wedding gown we treat gets individual care. Most wedding dresses are hand cleaned while some are spot cleaned or dry-cleaned in virgin solvent. We often utilize more than one method of wedding gown cleaning (combining dry-cleaning with spot cleaning, for instance.) We are not satisfied until we are certain every stain that can be removed is removed. Next, our gown care experts will hand press your wedding gown. Many companies will lightly steam your dress, but we have found the hand pressing does a much better job. Beads and sequins are very safe with our careful pressing. It happens, a snag, a loose button, or worse! Your beautiful wedding dress can sustain some damage on your wedding day. Don’t worry, our expert seamstresses can repair your wedding gown before it is preserved. Heritage Couture™ packages include up to 2 hours of repairs. Repairs are also available for for Heritage Select™ orders for an additional charge. We will preserve your wedding gown to Museum quality standards. Choose between Museum Method™ or Heritage Box™ wedding gown preservation. Both methods utilize the finest, acid-free and lignin free materials. If you do your research, you may find that many wedding gown preservation boxes used by your local dry cleaners are not acid-free, and many that are acid-free are not lignin free. This will damage your wedding gown, as lignin will break down over time, and then the acid-free box is no longer acid-free. So we insist on all of our preservation materials being both acid-free and lignin free. 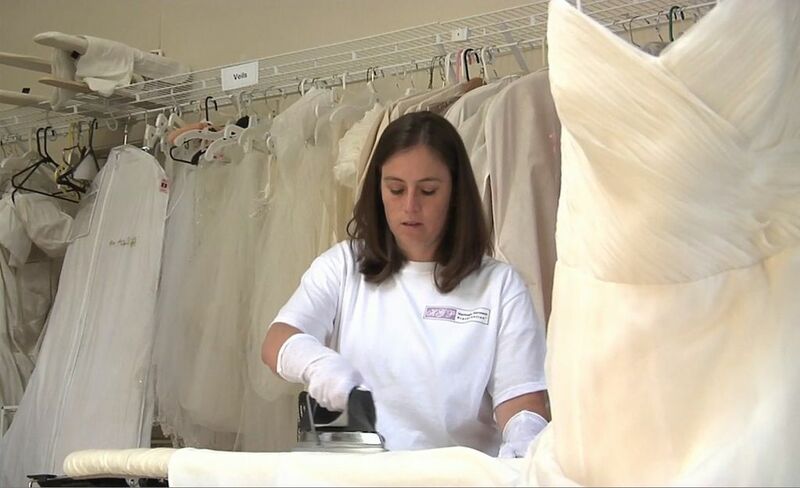 We utilize Signature Delivery for all wedding dress cleaning and preservation shipments. 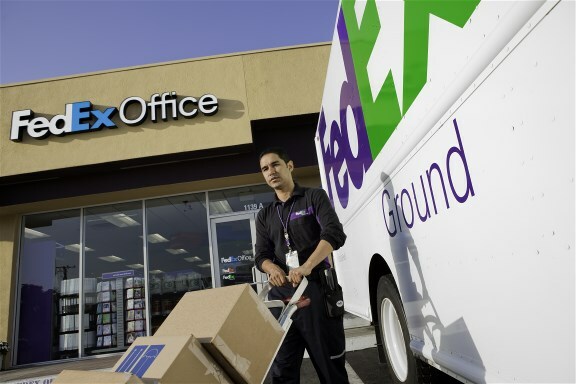 We sign for it when it arrives here and it must be signed for when returned to you. Your treasured wedding gown is never left on a door step. 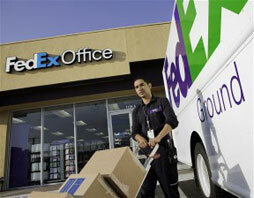 You will receive an email with a FedEX tracking number and estimated delivery date when your wedding gown ships. You will enjoy peace of mind knowing that we stand behind our preservation processes. Our Heritage Select™ preservation offers a 30 year warranty against yellowing. Heritage Couture™ preservation offers a lifetime warranty against yellowing, oxidized spots, etc. We also offer a 30 day satisfaction guaranty as well. If you are not satisfied with our service, you may return your wedding gown to us to be serviced again. We want every customer to be a happy customer. Read our comprehensive Wedding Dress Preservation Guide. Read about our Wedding Gown Restoration. I almost didn't even try to have my daughter's dress cleaned. I really didn't think that it was possible to get it back to normal and it wasn't going to be cheap. The train had been stepped on and the bustle was torn down so that the hem was dragged throughout the reception, 2 hours of dancing, and she wore it later to the hotel as well. It was a hot mess!I wish I'd taken a before picture. The delicate lace hem was completely black all the way around. After I shipped it to Heritage, I immediately started getting emails updating me on the status every step of the way. They sent me a detailed plan complete with pricing and I had the dress back within 2 weeks. Amazing service! And the dress looks brand new. I'm not sure how they did it, but you can't tell the dress has ever been worn. Definitely worth every penny! My wife and I were married in 2006 and after the wedding the gown languished in a cardboard box that eventually found its way to our detached garage/shop where it sat. A few weeks ago my wife pulled it out and was dismayed that not only was it still dirty (as expected) and moldy, animals had gotten into the box and chewed a hole. She wrote off the gown in her mind at that point lamenting that "the gown cost less than it would take to repair" Well I knew her birthday was a month away. I got her parents and my parents and my brother (who was best man) to pool funds and send the gown to Heritage. Needless to say they did an absolutely phenomenal job both mending the hole and removing every hint of stain and soil. They kept me up to date with every step of the preservation via email and once the gown was returned to us, my wife burst into tears with joy at seeing how perfect her gown had been restored. I have to thank Carmina at Heritage and my mother Sue for finding this business for me to solicit the repair and preservation. 4 stars here. Can't recommend enough. It's a tad pricey but you get every dollars worth. Thank you!!! Your process is excellent. The communication was very helpful. The dress packing addresses every detail. We were so impressed. "I would highly recommend using Heritage. They are true professionals and their quality of work is top notch! I have to admit, I was very skeptical shipping my daughter's wedding dress from NJ to CA, however I am so happy I did - what a GREAT job they did! Absolutely no issues at all -- I Highly Recommend using Heritage Garment Preservation! " Words can't express adequately what a wonderful job Heritage Garment Preservation did and how easy they were to work with. I was not the bride that took care of her dress (GASP). I had placed it in a box and meant to get it dry cleaned after our outdoor lake wedding, but forgot. Two years later, I found it and wore it out for Halloween as a "run away bride." Needless to say, the bottom was disgusting and there were some stains. I had gone to several local dry cleaners for them to either quote a ridiculous amount (over $700) or not be able to do it. Through the internet, I found this site. After reading the reviews, I filled out the paperwork and sent it out to be evaluated. They called the day they got it and gave great advice on what would be best. I was updated throughout the process. Never once did I feel pressured to do anything that I didn't agree with and they were so friendly and nice over the phone. I just got my dressed cleaned with some repair on beading. When my dress arrived to my house it was MORE BEAUTIFUL than the day I wore it. I would recommend this company to ANY BRIDE or anyone who had an article of clothing that they wanted clean or preserved. It is worth the money and you will be so happy afterwards. We love the job you did on the dress. It looks like new. It is beautiful and I plan to send you my other daughter's dress too. She gets married in August. I would recommend Heritage Garment for wedding dress cleaning and/or preservation! They were so friendly, easy to work with and made me feel like my dress was in good hands. I did a lot of research before and am really pleased with Heritage! Heritage Garment Preservation could not of been more knowledgeable and professional in the care of my daughter's wedding gown. I shipped her gown from New Jersey to CA always feeling her gown was in the best of hands. I was given updates from start to finish. If I had any questions, they were answered immediately.I would recommend so highly Heritage Garment Preservation in a heart beat! I am so glad that I found Heritage Garment Preservation to preserve my wedding gown, veil and jewelry. They did a fantastic job and it was a bonus that their office was close to my home in the Bay area. From start to finish, the service was very professional. The team there had awesome communication through all the steps of the process. My dress had several stains and rips and they fixed everything back to 100%. Their attention to detail is superb. My dress is now beautifully hanging in my closet and I don't have to worry about it aging. I would highly recommend Heritage Garment Preservation to anyone. Their pricing is also very reasonable. Thank you HGP!!! My talented mother-in-law graciously made my wedding gown which made it all the more special to me. I did a good deal of research before I finally settled on Heritage Garment Preservation to clean and preserve my gown. Despite the research, I was still a little hesitant to send something so precious to me, through the mail and to a company I had found online. It turns out that I had absolutely nothing to be nervous about! My gown was treated with the utmost care and was safely returned to me in top quality bag. I appreciate how Heritage Garment emails you updates about how the process is going with your dress; it certainly helped my nerves. I also loved how patient they were with my questions and concerns. Top notch customer service and a beautiful end result!